SAN FRANCISCO -- The Netflix reboot of "Full House" has fans of the show flocking to see the Tanner family home in San Francisco. "Everywhere you look" there are tourists near the "Tanner" family home in San Francisco, and it's starting to cause problems for neighbors. The famous home is on Broderick Street in San Francisco's Lower Pacific Heights. 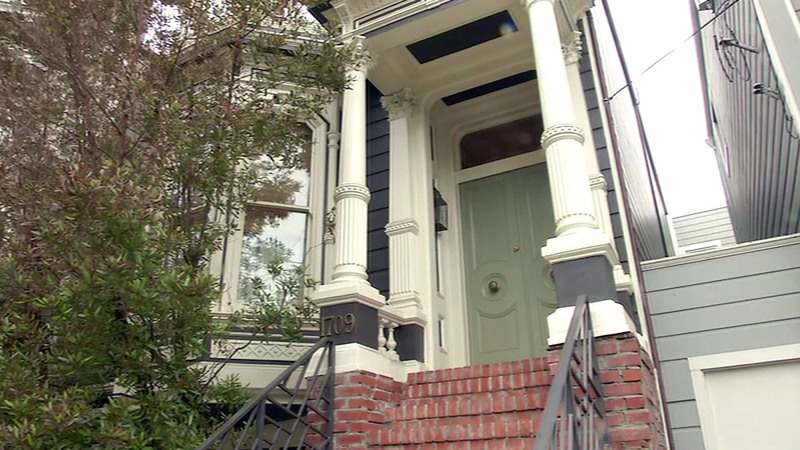 The exterior of the Victorian shows the home where Danny, Uncle Jesse, and the rest of the gang live, but they never actually filmed the show inside; that all happened on a set. One neighbor Mary Risley says fans don't seem to understand that -- one actually asked her if she's ever seen John Stamos. Since Netflix released the series "Fuller House" - fans have been showing up in big numbers. Ridley has met people from all over the world. The crowds sometimes block the street. "What I do is I usually open the garage door and they ignore it. And then I go out and say, watch out! Crazy lady backing out! So far I haven't hit anybody," said Mary Risley, neighbor. She says as many as 100 people will come by on a single day. The house looks different from when it was on the show; it has had a paint job, and no longer has a red door. Fans also flock to Alamo Square to see the 'Painted Ladies.' Those homes are shown in the opening credits of the show where the Tanner family is having a picnic in the park. The Wall Street Journal reports the Broderick house was last sold in 2006 for $1.85 million.